More world premiere symphony recordings for Havergal Brian fans! 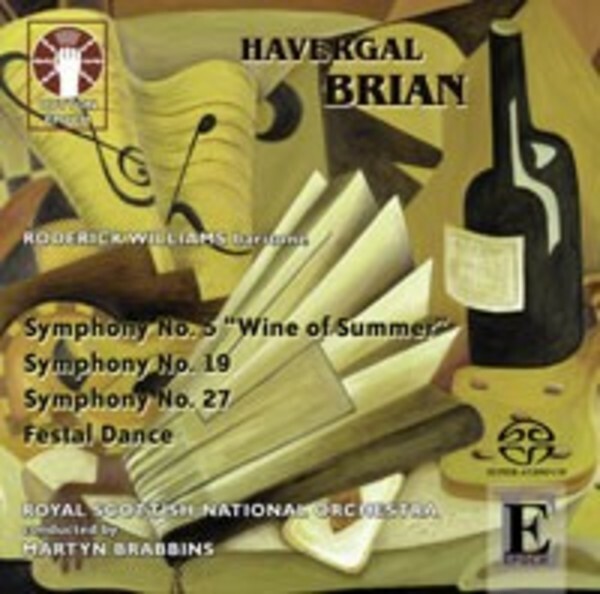 In this programme, Martyn Brabbins and the Royal Scottish National Orchestra continue their Havergal Brian series for Dutton Epoch with one of Brian�s most delightful scores, Wine of Summer, the fifth symphony of 1937. The eloquent baritone soloist is Roderick Williams, the orchestral detail beautifully realised in Dutton Epoch�s recording. Brian�s two more powerful later symphonies, No.19 (1961) and No.27 (1966-67), make a striking, even heroic contrast, while the ebullient and tuneful Festal Dance of 1908 completes the programme and receives an irrepressible reading.